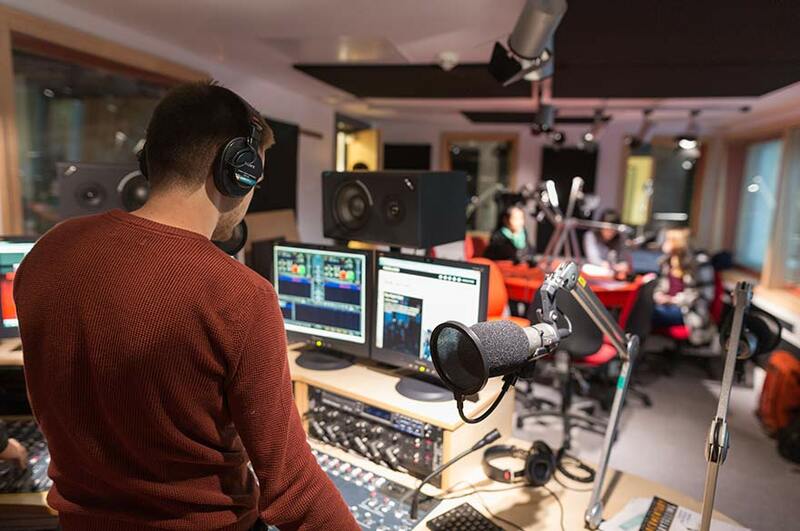 The Centre for Broadcasting & Journalism (CBJ) has outstanding specialist facilities to enable our journalism students to develop their skills in a professional real-life journalistic environment that is as close to industry-standard as possible. The multi-million pound centre, in the heart of Nottingham, includes a dedicated newsroom, a broadcast standard TV studio and gallery, and three digital IP-based radio suites. The tech team are incredible, they are such a friendly bunch and you learn so much by working closely with them every day. We had access to industry standard production and post-production equipment. Being able to use industry standard kit whilst studying really helped prepare me for life after university. The production facilities have a dedicated team of friendly and experienced technicians. They provide students with constant technical support and update and create systems that mirror the latest innovations in industry. You can tour our facilities at one of our open days.